Have you started your Thanksgiving menu plan yet? Are you putting it off until the last minute? Have you already had it planned for weeks? We just decided that we are staying home and hosting this year, so I am just starting my planning. Thankfully (pun intended) I’ve hosted Thanksgiving twice now so I know what works and what doesn’t. Since I’m not sure how the cooking will go with the baby, I’m going to stick to mostly tried and true recipes. The few new things I will be adding will be tested in the next few weeks. If they work I’ll be sharing them here! One thing I wanted to add this year was a new pumpkin dessert. 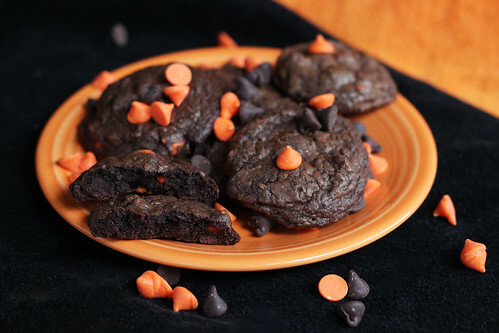 (Because you know I don’t have enough pumpkin recipes). And this cake is making the cut. 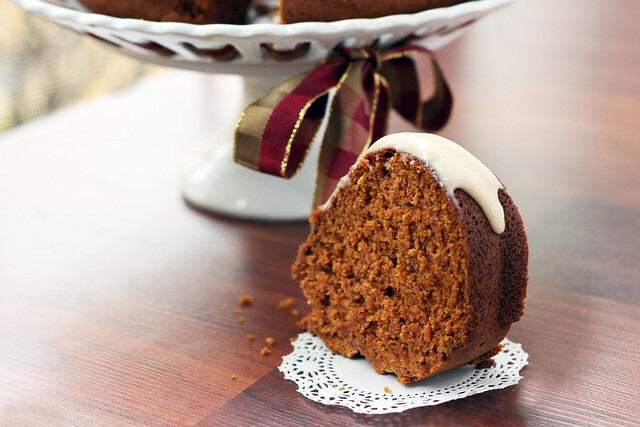 This Pumpkin Bundt Cake with Spiced Cream Cheese Glaze is so good. The kind of good that leaves you standing over the kitchen sink eating “just one more” sliver to, you know, “even things out”. Because you can’t have a slightly crooked slice… I really had to laugh when just 15 minutes after I snuck a[nother] piece I noticed Jesse lingering at the kitchen sink. When I asked him if he was eating bundt cake he had a totally busted look. It can’t be helped. This cake is delicious. Preheat oven to 350 degrees. 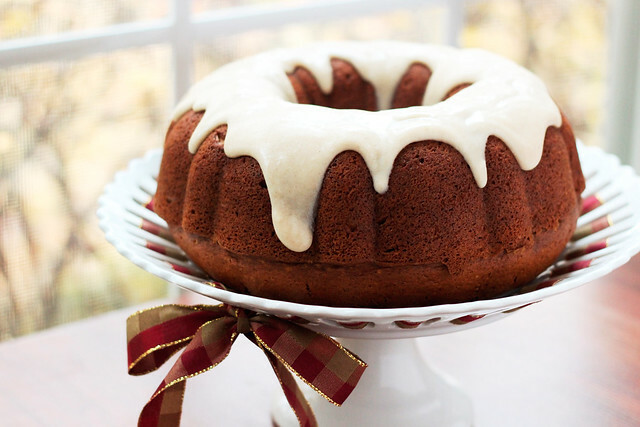 Prepare a bundt pan by spraying well with non-stick cooking spray. In a medium mixing bowl, whisk together flour, baking soda, cinnamon, salt and pumpkin pie spice. Set aside. In the bowl of a standing mixer beat together sugar and canola oil. Add the eggs, one at a time, and vanilla, beating well and scraping down sides of the bowl between each addition. Alternate adding the dry ingredients in 3 additions and the pumpkin in 2 additions (starting and ending with dry ingredients), beating until combined and scraping down the sides of the bowl as needed. Pour the batter into the prepared bundt pan. Bake for 60-65 minutes or until a toothpick inserted into the thickest part comes out clean. Allow to cool for 10 minutes before flipping out onto a wire cooking rack. While the cake is cooling, add the melted butter and softened cream cheese to a clean mixing bowl. Beat until smooth and creamy. Sift together the confectioners sugar, pumpkin pie spice, and salt, and beat until light and fluffy. Add the vanilla and 1 tablespoon of milk and beat. Add additional milk as needed to get a pourable consistency. 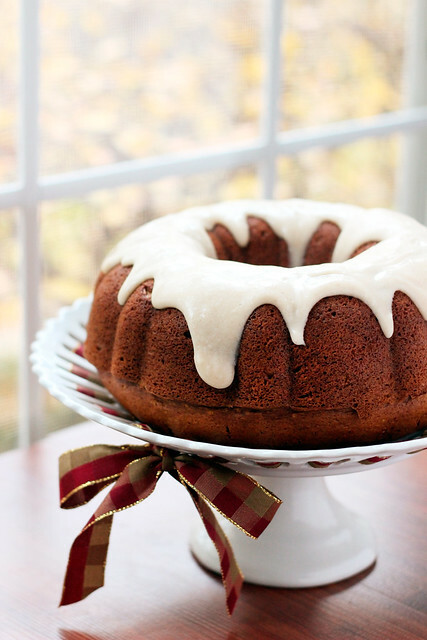 Once the cake is cool, pour the cream cheese glaze over the top of the bundt cake. You can use a spatula to encourage it drip down the sides, if needed. This time last summer we were living in China. If you would have told me then that a year later we would be living in Chicago, I might have laughed at you. Then again, you could almost say that about everywhere we have been/have lived for the past 4 summers. To say that life has been unpredictable is a bit of an understatement. So here I sit. 37 weeks pregnant, living in Chicago, and rejoicing that I have once again been reunited with my ice cream maker (just like I did when I made this and this). This ice cream came about because of 2 almost unbelievable words. Leftover. Brownies. What kind of a person has leftover brownies?! As crazy as it sounds, I did indeed have a few brownies left over in a pan that were just a day or so away from becoming stale. Not wanting to be wasteful, I decided I must use them to make ice cream. The fudge ripple just seemed like a natural addition to round out the entire ice cream experience. For the ice cream base I went with a Philadelphia style vanilla. Philadelphia style ice cream does not have a custard (egg) base. The milk and cream are simply heated together with the sugar and then chilled until churning. It’s slightly easier than custard style ice cream. Some people think you lose some of the rich, creaminess that the custard provides while others swear they can taste the egg in custard ice cream and therefor prefer Philadelphia style. Me, I can go either way. I like custard. I like Philadelphia style. Custard is probably a touch richer, but Philadelphia style is still creamy and delicious. Can you really go wrong with homemade ice cream? I don’t think so. In a medium saucepan, stir together 1 cup of heavy cream and sugar. Scrape vanilla bean seeds into the mixture and then add the pod. Stir until sugar is dissolved. Remove from heat and add the rest of the heavy cream, milk, and vanilla extract. Place the mixture in the coldest part of your fridge and chill thoroughly, I would recommend at least 4 hours. After chilling, remove the vanilla bean pod and churn in your ice cream maker according to manufacturers instructions. After churning, spread 2-3 tablespoons of fudge ripple sauce over the bottom of your desired storage container*. Add several dollops of ice cream and smooth over the fudge ripple, careful not to stir the fudge into the ice cream. Sprinkle with brownies and press into the ice cream. 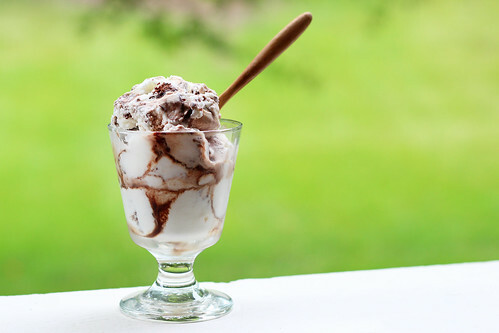 Drizzle with several tablespoons of fudge ripple. Add more ice cream and repeat process until you have used all of the ice cream and brownie chunks and most of the fudge ripple. 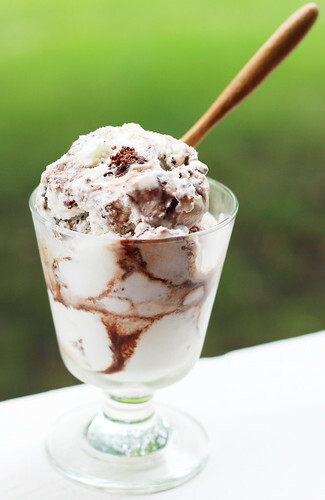 Press plastic wrap into the top of the ice cream, put on the lid and allow to freeze for several hours before serving. *I use a glass Pyrex container. I also like to put it in the freezer for about an hour before I start layer the ice cream/fudge. I can’t say for sure if it makes it easier, but in my mind it seems like it would. 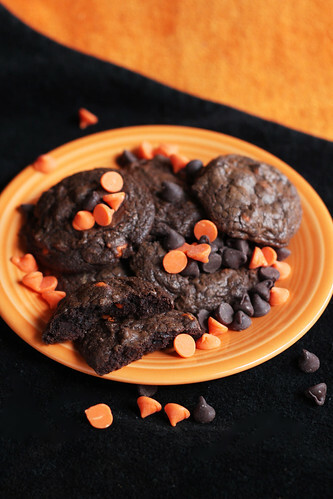 In a medium sauce pan, whisk together the sugar, corn syrup, water, and cocoa powder. Continue whisking and heat over medium heat until the sugar is dissolved and the edges start to bubble. Continue whisking as the mixture comes to a low boil and then cook for an additional minute. Remove from heat and stir in the vanilla. Allow to cool to room temperature and then chill in the refrigerator until ready to use. Make sure it is very cold when you are ready to use it! In the Weekend Dish Post I wrote on Sunday I talked about how crazy it is that it is already August. It’s not crazy just because it’s a month before my due date. And it’s not crazy just because it’s already the 8th month of the year. It’s also a little bit crazy because it’s my birthday month. And not just any birthday. My 30th birthday. The big 3 – 0. I have officially said goodbye to my 20s and hello to my 30s. I needed to celebrate. With cake. A rich, chocolatey, over-the-top cake. This cake met all 3 of my birthday cake requirements. I was initially inspired by Cheesecake Factory’s Chocolate Tuxedo Cream Cheesecake and I had hoped to recreate it, but the paranoid pregnant lady in me decided to avoid the eggs in the vanilla cream mousse. I think what I came up with instead was even better. Who doesn’t love a tall layered birthday cake? *These amounts may seem a little weird, I adjusted the recipe so the cheesecake wouldn’t be too thick for stacking. Preheat and oven to 300 degrees. Line an 8-inch spring form pan with a circle of parchment paper. Tightly wrap the outside of the pan with 2 sheets of foil. In the bowl of standing mixer fitted with a paddle attachment, beat together the cream cheese and melted chocolate until smooth. Scrape down the sides of the bowl and add the flour, salt, and sugar. Beat until well combined and smooth. Add the vanilla and beat to combine. Add the eggs one at a time, scraping down the sides of the bowl in between each addition, being careful not to over beat. Pour the batter into the prepared spring form pan. Bake at 300 degrees for 50 minutes. After 50 minutes, turn the oven off and set a timer for 10 minutes. After 10 minutes, crack the oven door and allow the cheesecake to cool in the oven for about 5 minutes, then remove and place on a rack to cool completely (Stepping down like this prevents cracks!). Cover with plastic wrap and refrigerate over night to cool completely. *These amounts may seem a little weird. I reduced the recipe to make 2 8-inch layers instead of 3. Preheat oven to 325 degrees. Prepare 2 8-inch cake pans by greasing pans, fitting bottoms with parchments paper, greasing parchment paper, and flouring pans. Into a large mixing bowl (or bowl of a standing mixer), sift together the sugar, flour, cocoa powder, baking powder, and salt. In a liquid measuring cup combine the buttermilk, eggs, and vanilla. In another liquid measuring cup, add the butter to the hot coffee and stir to melt. Create a well in the middle of the dry ingredients. Pour in half of the buttermilk mixture and beat on low speed. Add half of the hot coffee mixture and beat on low speed. Repeat with the rest of the buttermilk and hot coffee. Beat just until combined.Scrape down sides of the bowl again and then beat for another 15 seconds. In a very cold bowl of a standing mixer, beat the heavy cream with a whisk attachment until it just start to thicken and form soft peaks. Add the confectioners sugar and beat until the peaks stiffen up just a little bit. Add the vanilla and beat for another 30 seconds- 1 minute, or just until stiff peaks form. Keep chilled in the fridge until ready to use. 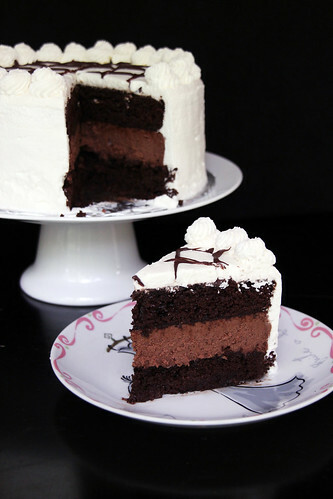 *The chocolate syrup does 2 things – keeps the cake moist and acts like a glue between layers. Place the first chocolate cake layer on the cake board. Drizzle with 1-2 Tbsp syrup and spread evenly across surface. Next, carefully place the cheesecake on top of the chocolate cake (it should be solid enough to carefully flip off of the spring form bottom, then just remove the parchment paper circle). Drizzle with syrup and spread across surface again. Top with the final chocolate cake layer. Drizzle with syrup and spread across surface. Frost with a thin layer of whipped cream frosting (crumb coat) and refrigerate for 30-60 minutes. 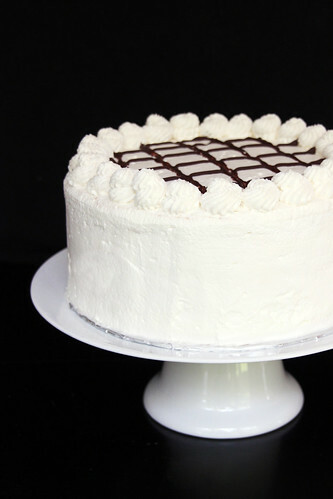 Top with a generous amount whipped cream frosting. Spread over cake and smooth out as desired. Place leftover frosting a pastry bag fitted with desired tip and pipe a border around the top (I used a Wilton 4B tip). If desired, place melted chocolate in a Ziploc bag and drizzle over top of cake in any pattern you like. Looking for more birthday cake ideas?